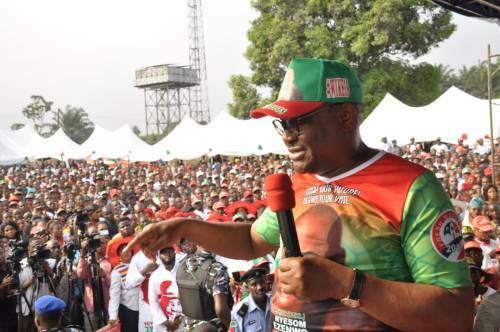 Governor Nyesom Wike of Rivers state, south-south, has asked political rivals he offended during the just-concluded elections in the state to forgive him. Naija News reports that the governor made this request while during a family Thanksgiving at the Salvation Ministry Headquarters in Port Harcourt on Palm Sunday. Governor Wike also said despite the long drawn battle against him during the same period, he has forgiven those who offended him as well. His words: “Nobody has won and nobody has lost the elections. But Rivers State has won. Wike said that he was in Church to give thanks to God for his faithfulness in the face of fierce political battles during the 2019 General Elections. The Governor thanked the Presiding Pastor of Salvation Ministry, Pastor David Ibiyeomie for his spiritual support during the long drawn political battle. In response, Pastor Ibiyeomie prayed to God to accept the governor’s Thanksgiving and bless him. The Pastor said by the Special Thanksgiving, God will perfect everything that concerns Governor Wike and his family.